Today’s breakfast was at Cajun Kitchen in Santa Barbara. Cajun isn’t the first thing that comes to mind when I think of Santa Barbara, but this place has enough diversity that I’m not particularly surprised that this place made the top of several people’s recommendation for a good breakfast joint (including my brother the Secret Service agent and several folks over at Chowhound.com). I rather enjoyed Cajun Kitchen. It’s set up as your basic breakfast joint/coffee shop, with a counter for people like me that are eating by themselves. Menu-wise, the breakfast choices are mostly your basic eggs and sides, with a heavy representation of both Cajun and Mexican ingredients (chorizo and several salsa dishes). While the person down the counter from me had a dish with some excellent looking salsa fresca on it, I opted for the Cajun Eggs (with cajun sausage) with hashbrowns and wheat toast. All in all, this was a solidly good breakfast on all levels. The eggs were nicely scrambled (and people that know me also know that I usually avoid scrambled eggs since I’m picky about them), with a very generous portion of diced sausage mixed in. 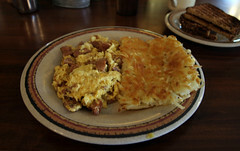 The hashbrowns were also nicely down, with a nice brown crisp on the outside, and a nice creamy fully-cooked inside. Top that off with some hot sauce and Tony Chachere’s Creole seasoning, and it was a pleasantly spicy meal. No cons on this place, everything was good. The service was friendly, my coffee promptly topped off, and the ambiance that of a nice, friendly neighborhood joint. 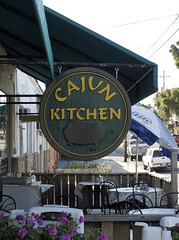 So, Cajun Kitchen is a definite recommendation of mine for folks looking for a good, solid breakfast in Santa Barbara. After a night in Porto, it was time to head out for the main purpose of our trip, a week-long hiking trip in the Douro Wine Valley. After waking, having a pleasant breakfast at our hotel, and heading out to the train station, we hit the first complication: a “greve” (Labor strike). All of the trains and ticket offices were shut down, but the folks arranging our trip at Portugal Green Walks were able to easily arrange alternative transportation, so instead of a scenic train ride up the Douro river valley, we instead had a surprisingly scenic drive across Portugal, seeing the Serra do Marão mountains and passing through the recently-opened Marão tunnel and Vila Real, getting dropped off at our guest house in Pinhão mid-afternoon. In all that shuffle, we hadn’t really had a chance to grab lunch, so we headed down into Pinhão to try and find a light snack to tide us over to a later Portuguese dinner. This is always a bit of a challenge in Portugal, since while various travel guides insist that Portugal doesn’t do the siesta of neighboring Spain, especially in the rural parts of Portugal, they essentially do observe it: the vast majority of restaurants, and a good fraction of other businesses, will be closed in the afternoon, with a smattering of cafés starting to open in the mid-afternoon if you want to sit around drinking coffee or beer while watching futebol. But we found one major exception to this on just down from Pinhão’s train station: Ó-Por-Co, a simple little café serving an assortment of wine and petiscos (small plates).